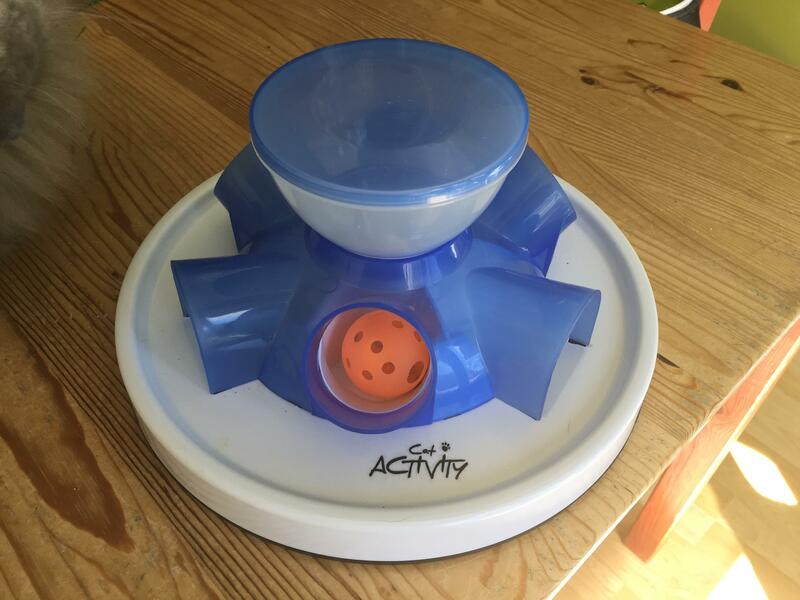 If you started feeding your cats via foraging toys from a young age or if your cats are extremely motivated to acquire carbs you may find they are difficult to challenge. If your cats are like mine they can get food out of virtually anything you give them. I refer to these guys as “master foragers” and put them in the “Kitty Einstein” category. These cats can prove tough to challenge. This post aims to offer some examples of how you can increase the difficulty of the food puzzles you offer for greater mental stimulation and, if weight loss is your goal, to make the dry food harder to achieve. One of the easiest first steps you can take is simply to hide the toys. Rather than filling them and leaving them in plain sight, subtlety place them behind the leg of a chair, behind the sofa, under a lightweight cardboard box or inside a brown paper bag. Hide them in locations of variable discreetness based on your cats’ motivation and ability. Every cat is different. As mentioned above my cats can acquire food from virtually any object I put in front of them, but if I hide the toys they will not seek them out. I find this fascinating. Making cats “hunt” down the toys before they can “work” them works for many households, just not mine. In my own home I spend more time digging them out from under furnishings! 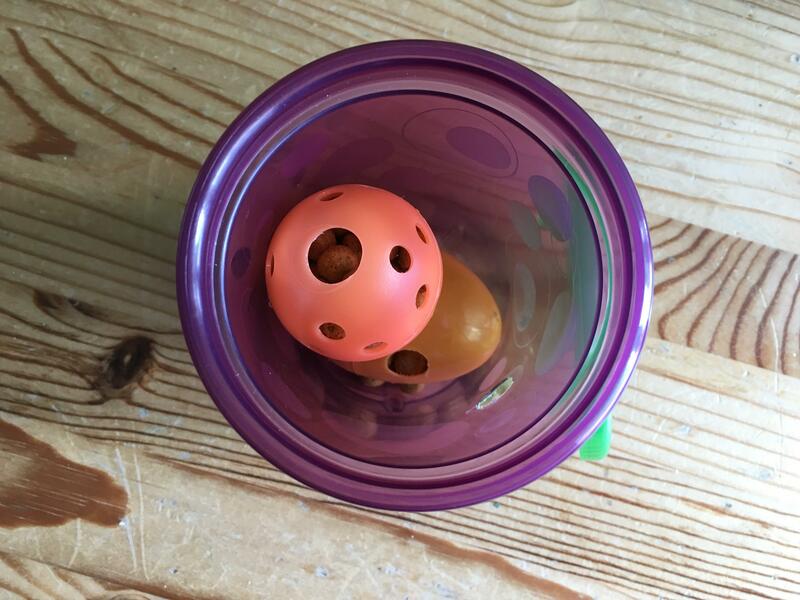 I refer to this as “getting them back out onto the playing field” or “foraging for humans!” If you have kids, put them to work and make them seek and find the toys that need refilling! Hitch proudly (and swiftly) empties all five puzzles in the Trixie Pet Poker Box. 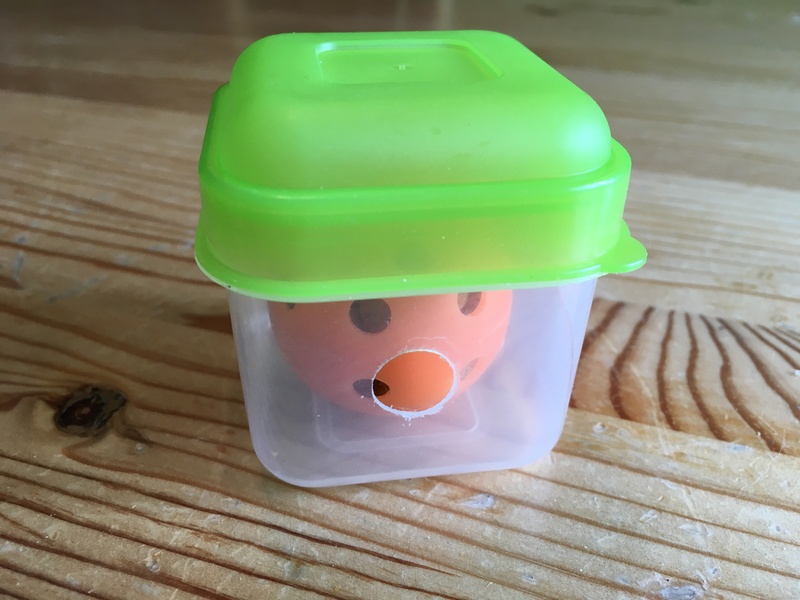 The focus of this post is to help you put your creative thinking cap on to combine toys you already have to increase the challenge. You do not always need to acquire new objects but simply work with what your cat has already mastered. 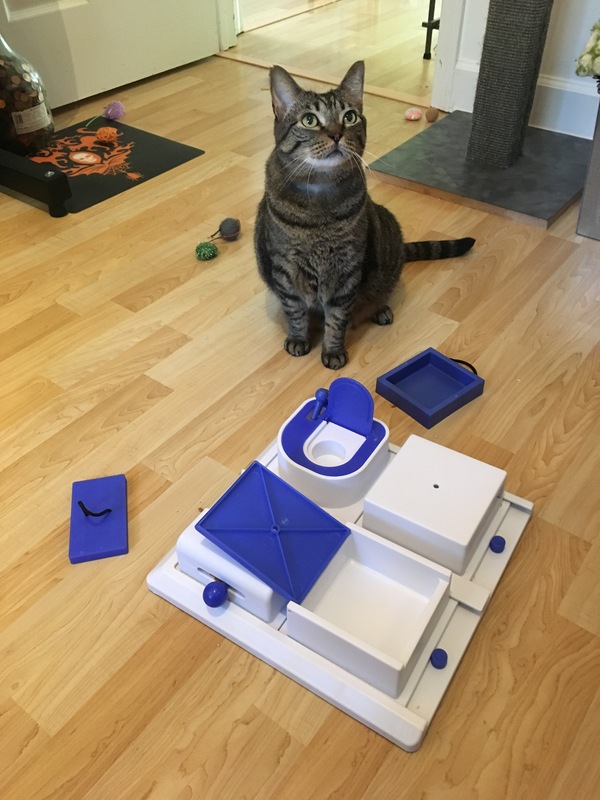 The following is a pictorial tour of many of the toys that have already been featured on Food Puzzles for Cats (or will soon be featured) and the ways with which you can combine them for increased difficultly. If you do not already know, Food Puzzles for Cats is a website dedicated exclusively to all things food puzzle related. You should check it out! 1. Fill ping-pongs from Fundamentally Feline. 2. Place inside gear toy from Fundamentally Feline. 3. Offer to your Einstein! 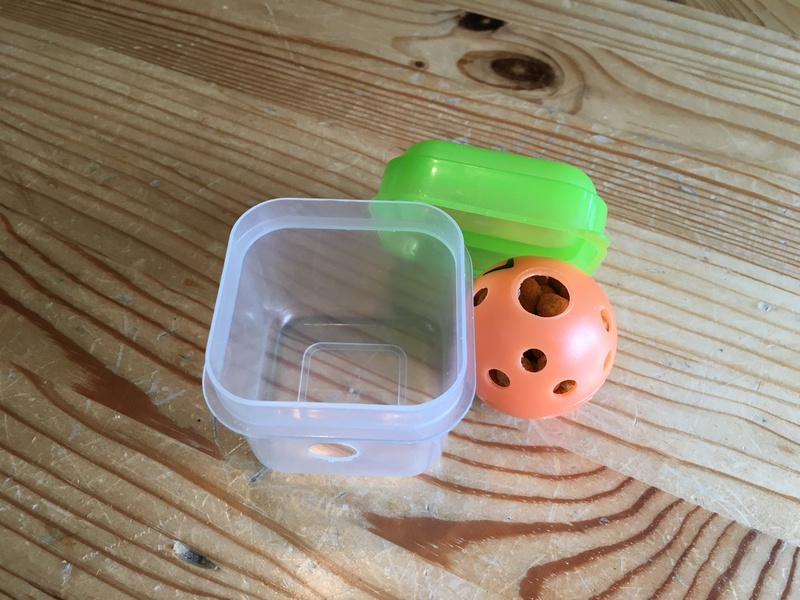 Combining objects as shown here requires the cat to "double forage". They must get the food to fall out of the smaller object and whack it around with enough gusto to finally achieve a piece of food from the larger vessel. It requires much more manipulation and effort. As another alternative you can "dummy fill" an object so that there is something floating around inside that sometimes obstructs the opening. 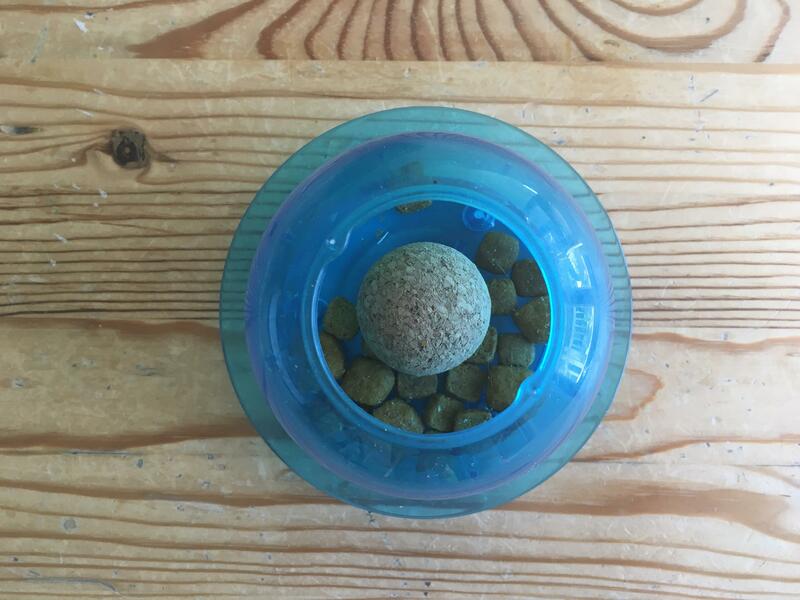 This is often less tedious for the owner than filling small food puzzles, so for busy families a dummy fill may be a quicker & easier choice. 1. 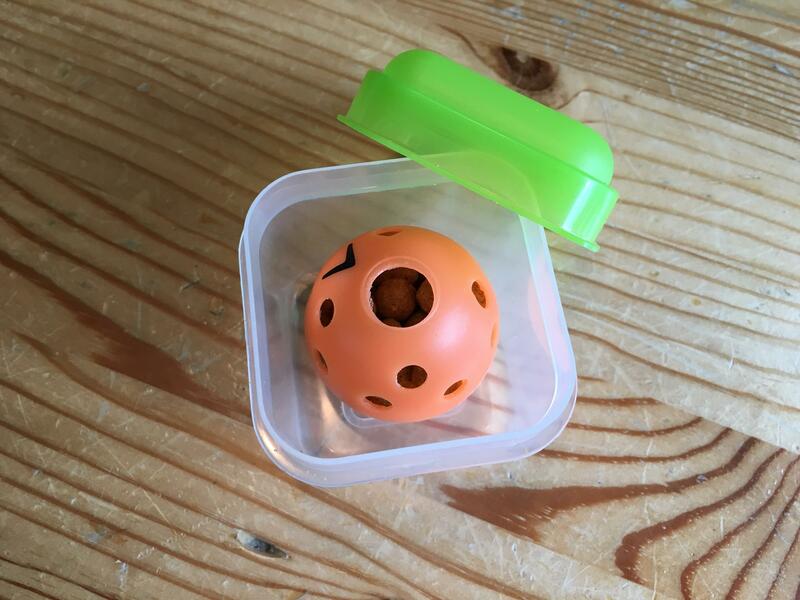 Fill foraging wiffle ball from Fundamentally Feline. 2. 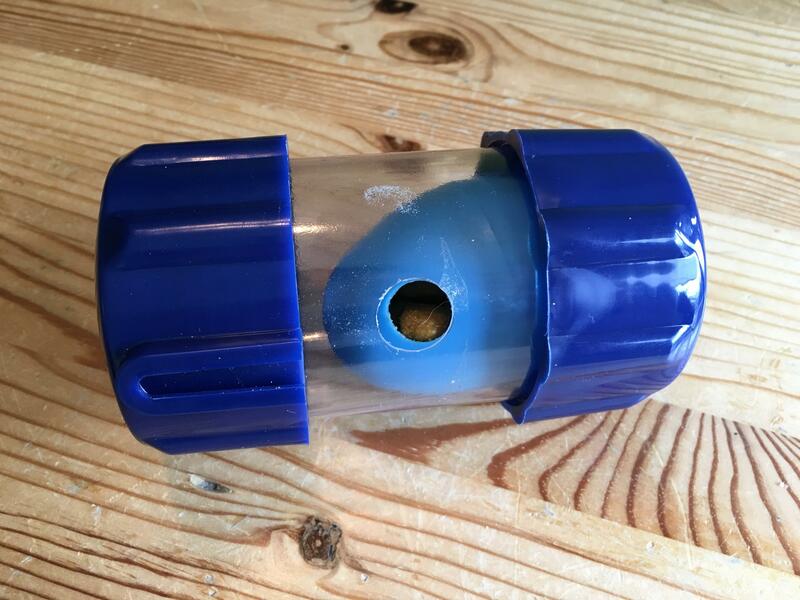 Place inside Busy Buddy Kibble Nibble by Petsafe. 3. 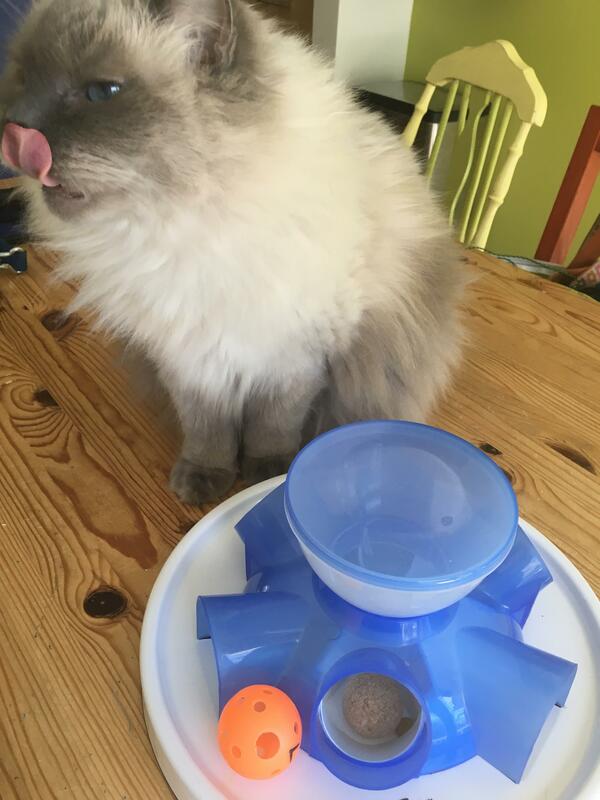 Offer the challenge to your Kitty Einstein! 1. Fill foraging egg from Fundamentally Feline. 2. Place inside XL gear toy from Fundamentally Feline. 3. Offer this heavy & hard to roll challenge to your cat! 1. 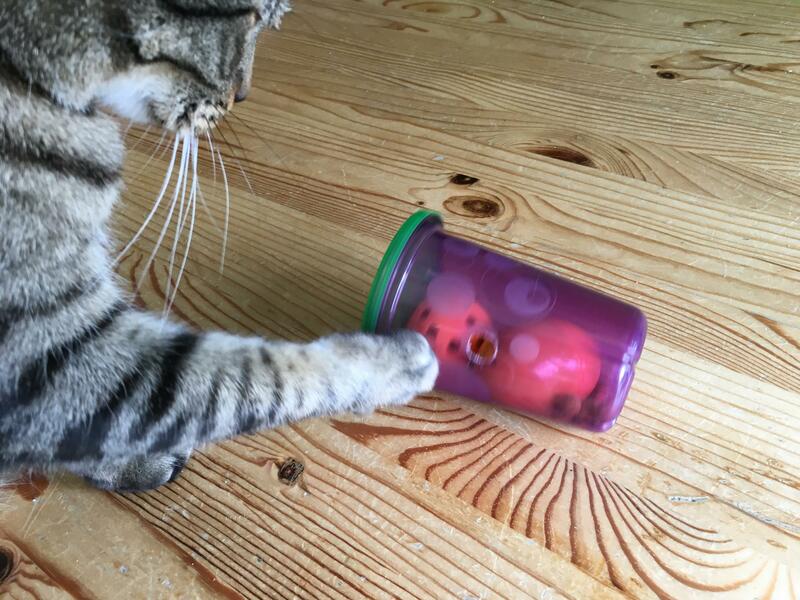 Fill a mini egg/ping-pong by Fundamentally Feline..
2. Drop inside foraging cup by Fundamentally Feline. 3. No match for my master forager! 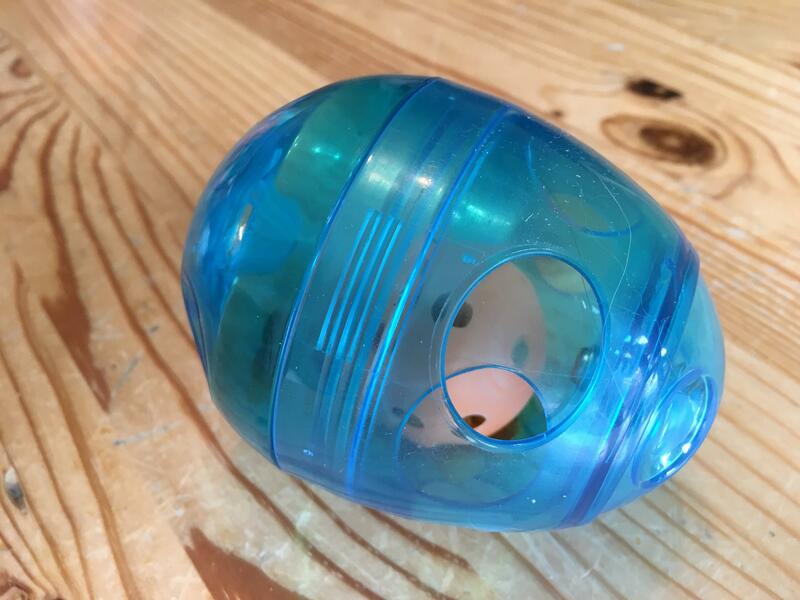 Cube-shaped objects are one of the most difficult puzzles you can offer your cats. I recommend starting cube-shaped toys on an area rug so that they can learn to easily flip the toy. Once they get the hang of that they can typically utilize the cubes on any surface, but if you need to increase the challenge even further, you guessed it, double up! Take a look at this video to see a master forager whacking a cube around like it is nothing! 1. Fill a ping-pong by Fundamentally Feline. 2. Place inside foraging cube by Fundamentally Feline. If nothing else I do hope you are appreciating the versatility of the foraging ping-pong balls! 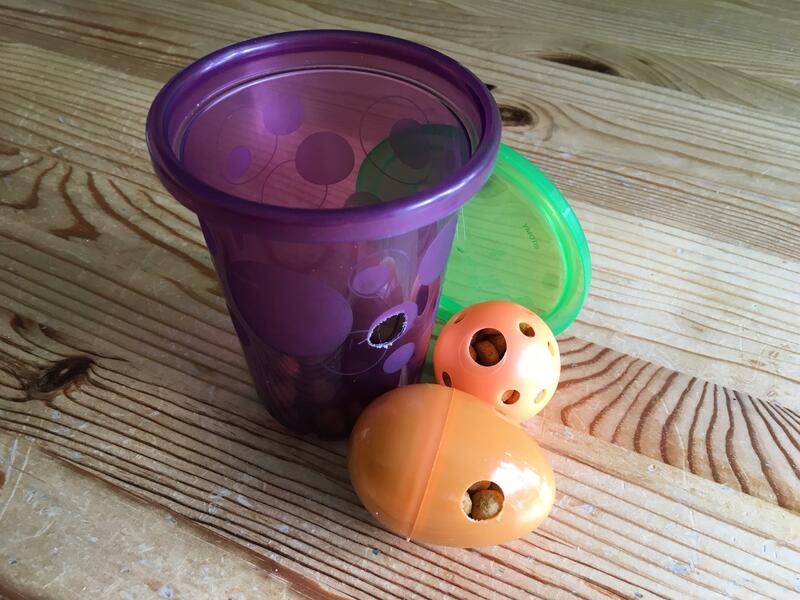 They can be used in many creative ways as can the mini and full sized eggs. 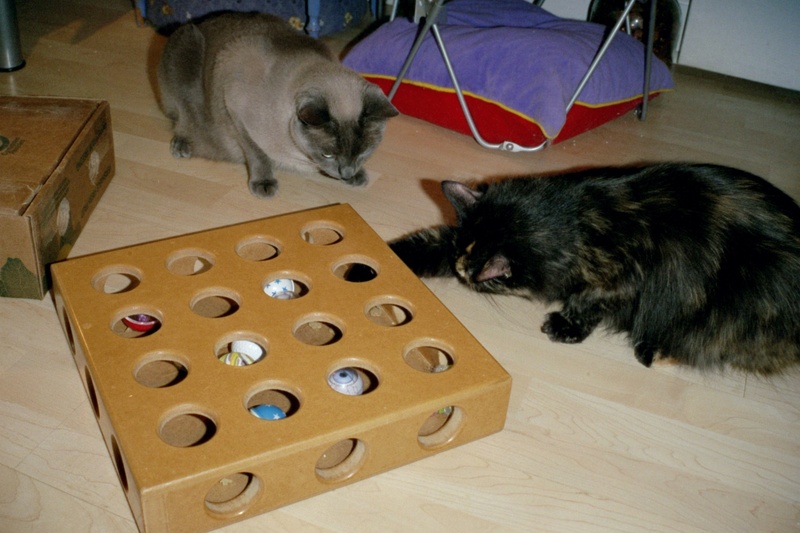 In my experience rolling puzzles are, as a whole, more difficult for most cats than are stationary puzzles. 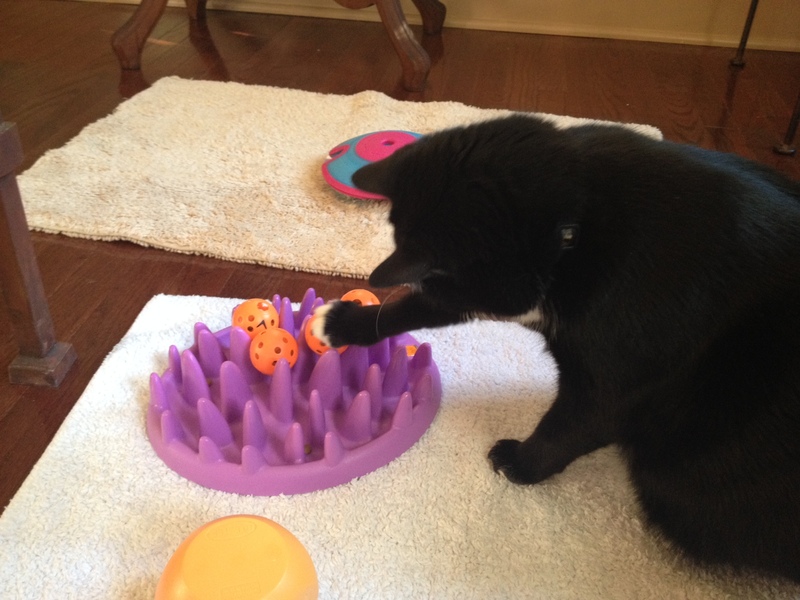 In fact, some cats completely refuse to use rolling puzzles, but are masterful paw manipulators and need to have their stationary toys made more difficult. Here are a few ideas to do just that! 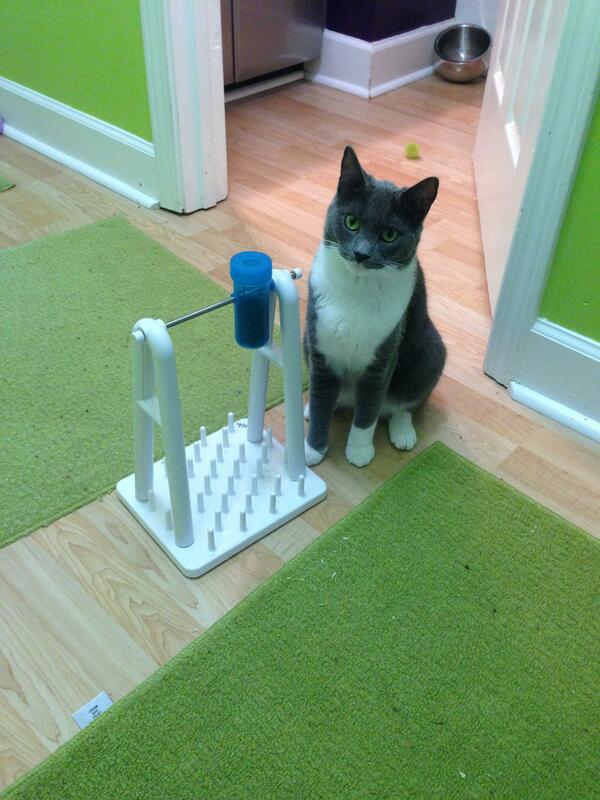 Either fill ping-pong or just drop in regular cat toys. 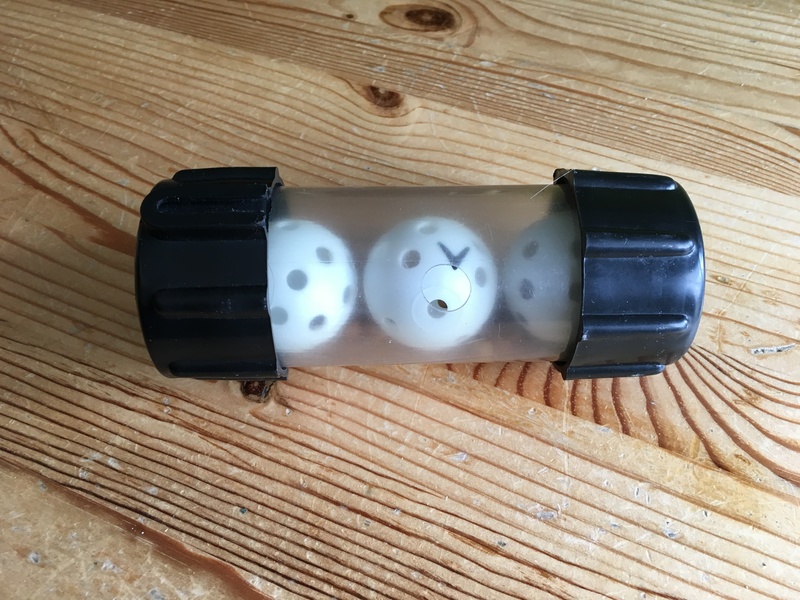 You guessed it, ping-pong balls again! 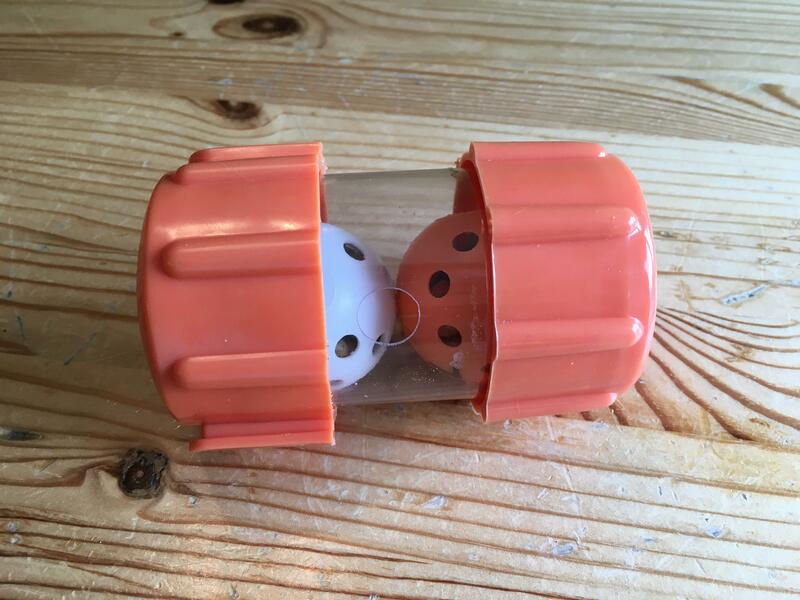 Either fill the ping-pong and drop inside the wells of this Trixie Pet Tunnel Feeder or place balls and mice in the tunnels so your cat has to work around them or fish them out! Notice the alternative cork ball in the tunnel. 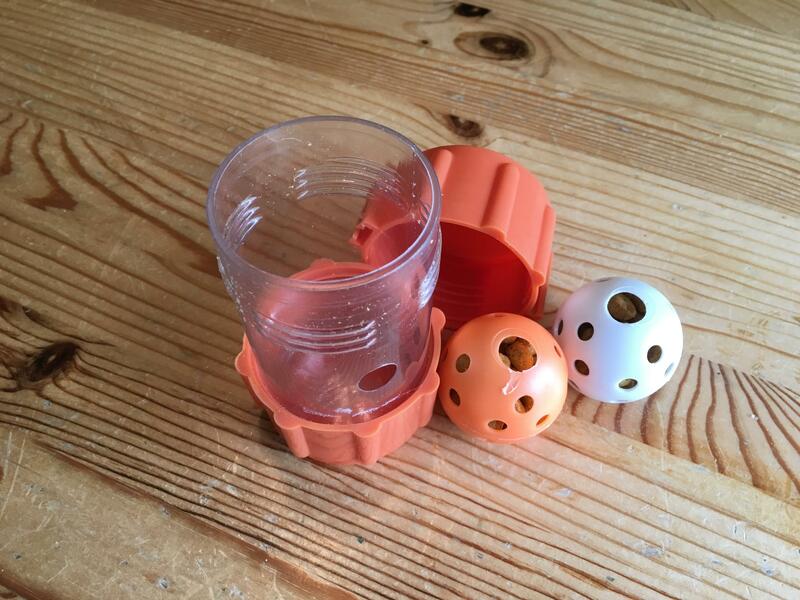 Left: Fill ping-pongs and place within the spikes of the "Catch" so your cat has to spin the balls to allow the food to drop below to be fished out with a paw. 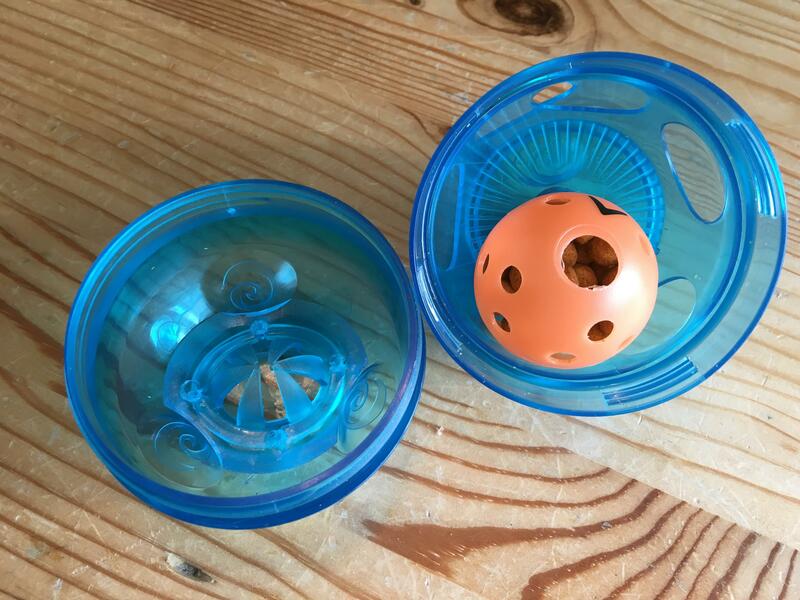 Right: Fill Peek-A-Prize box with loads of balls and cat toys making it difficult to achieve the dry food OR fill ping-pongs and drop inside so they have to spin the food out of the ball and extract from the box. Weighted toys also add significant challenge. Check out the Pyramid by Nina Ottosson. 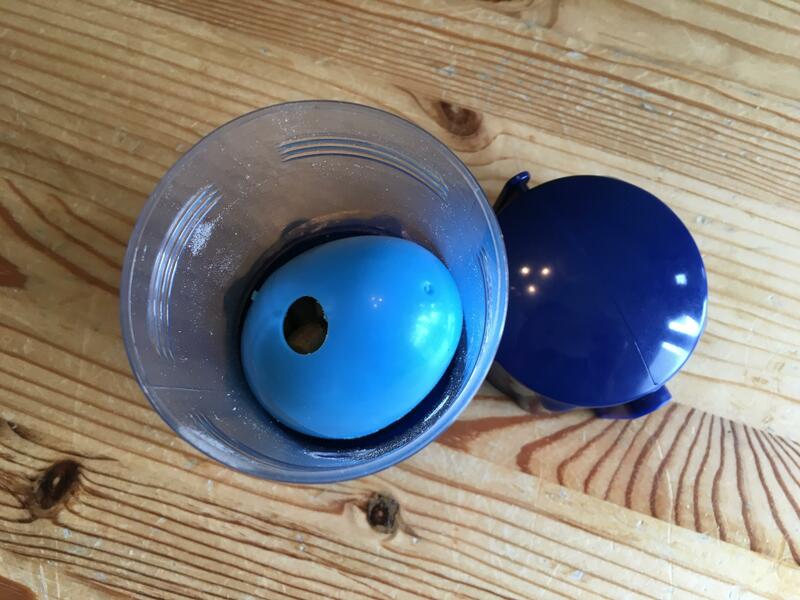 But you can also add weights or a large cats eye marble to a toy like the Mad Scientist (below) so that the beakers do not tip as easily and the weighted object inside also obstructs the openings from time to time making it difficult to dispense the food. 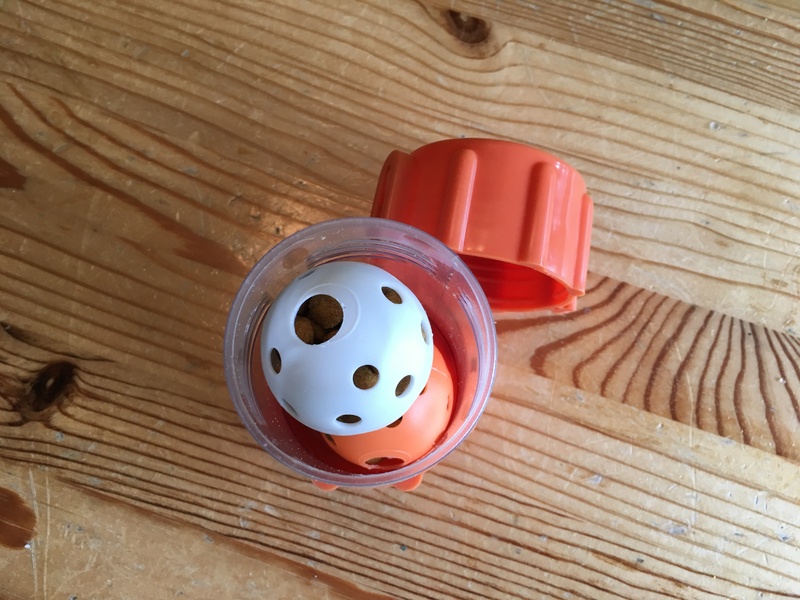 Place ball or ping-pong inside Fishbowl as an obstacle! Weights/marbles in beakers=heavier & obstruct flow. 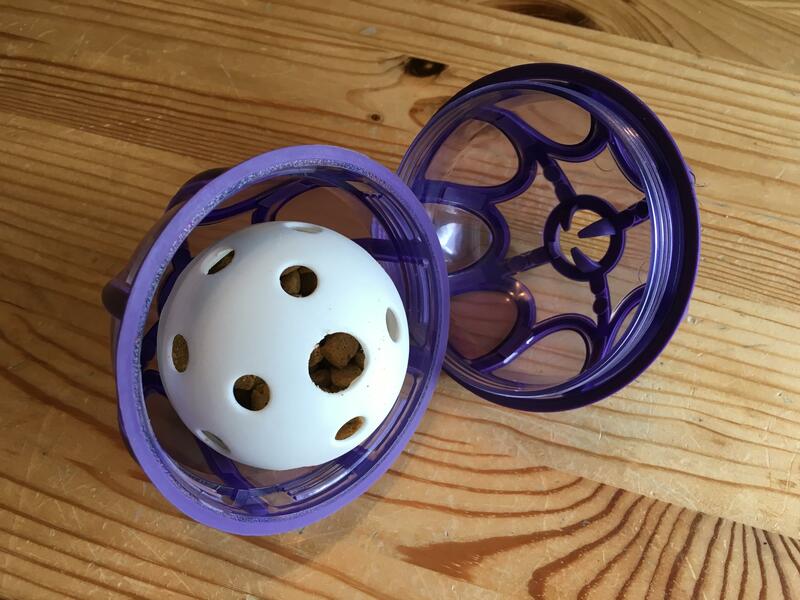 Long gear filled with 3 pre-stuffed ping-pongs. 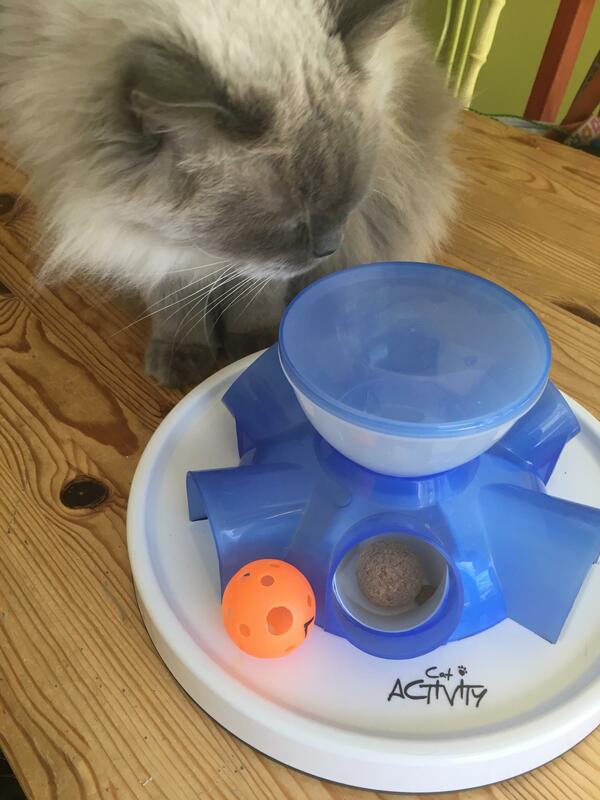 Do not offer these suggestions to your cat unless they are truly skilled at foraging as we do not want to frustrate them and have them decide that it is no longer rewarding to interact with the food puzzles. Remember too that it is imperative that cats eat EVERYDAY and multiple times a day. You never, ever want to take the, “if they are hungry enough they will figure it out” mentality as that is a great way to make a cat very sick. 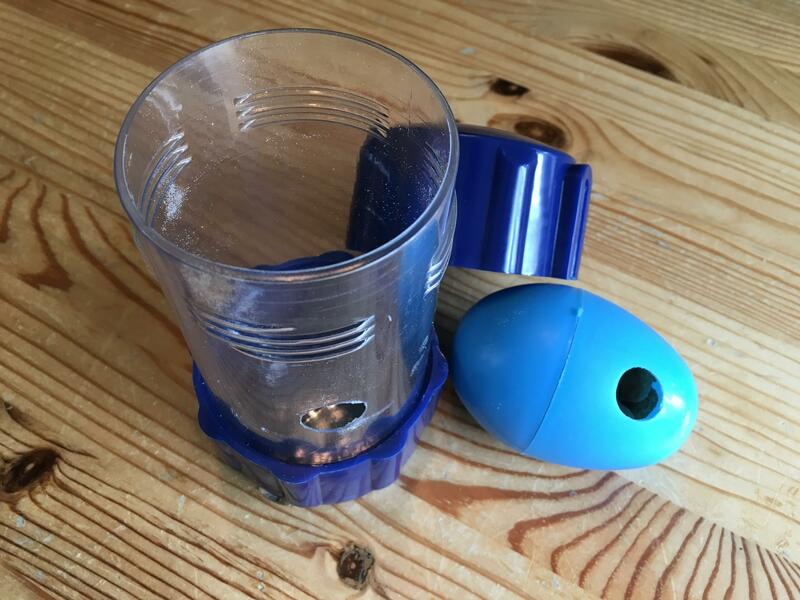 So if you have an easy, beginner toy such as the Egg-Cersizer featured below, please don't throw it away! Double up to increase the challenge! 1. Fill ping-pong from Fundamentally Feline. 2. 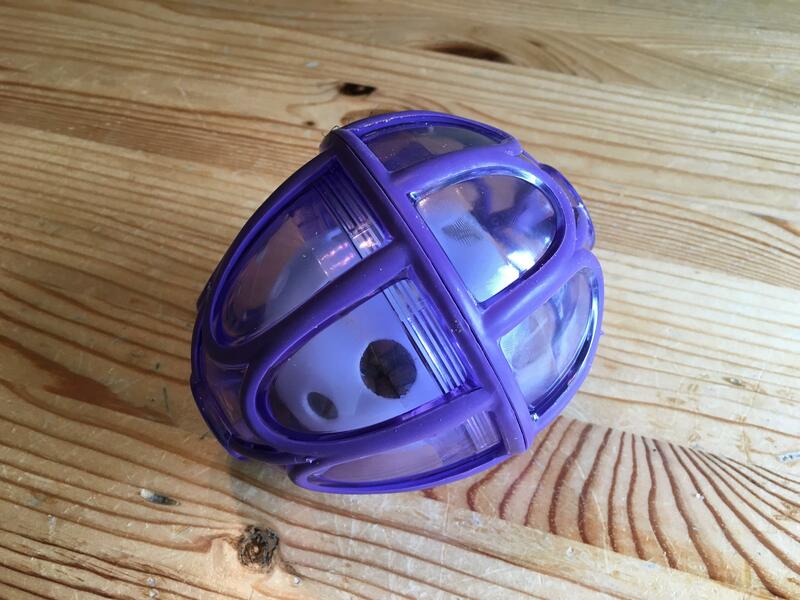 Place inside Egg-Cersizer from Petsafe. 3. 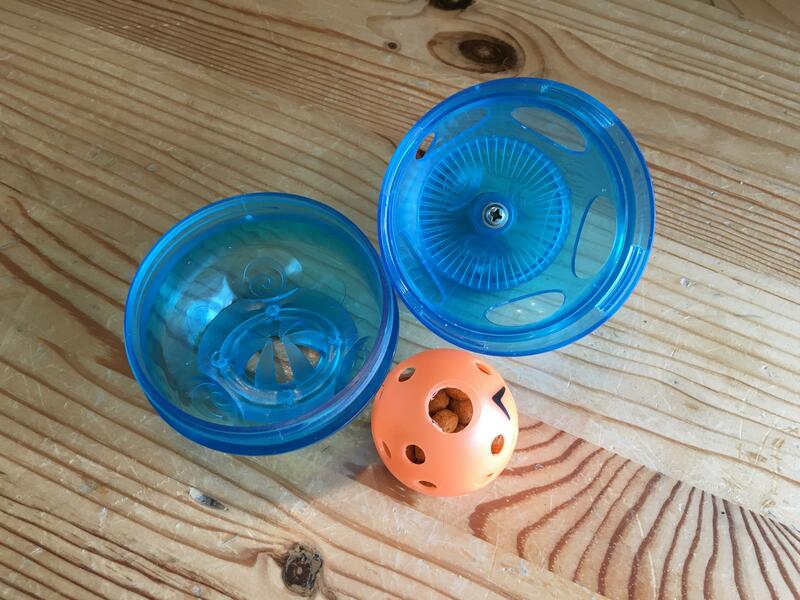 Set to one hole & you just made an easy toy hard! I certainly hope that this post helps you get creative and helps you challenge your cats. Visit my You Tube channel or the Foraging Videos tab on this site for more foraging fun! Happy foraging!